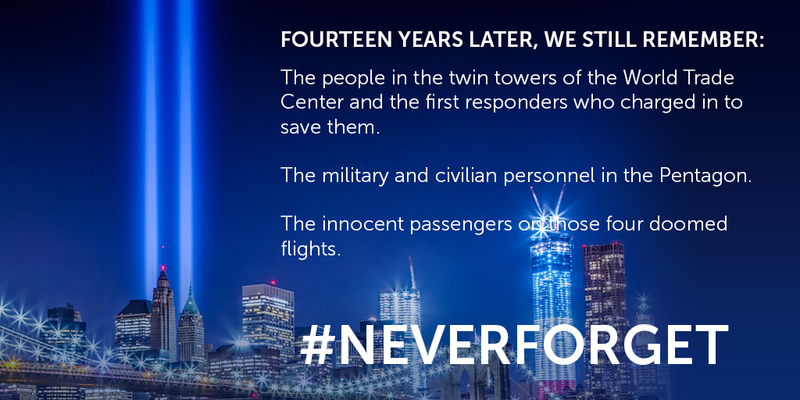 Americans remembered those who lost their lives due to the terror attacks on the Twin Towers 14 years ago today. Here is an excerpt from her op-ed at The Journal IJReview. It is priceless and well worth reading the whole thing! As tourist season winds down in Alaska, so does the sightseeing trip of America’s busiest tourist. The President heads back to the beltway bubble after three days in the wondrous Last Frontier. While here, he enjoyed spectacular autumn weather which he commemorated with many selfies on a stick. He danced, he held a fish, he hiked a glacier (thankfully not the Mendenhal Glacier, for that chunk of ice is, literally, the size of Rhode Island. Instead, he enjoyed one of the other 100,000 Alaskan glaciers). And, he renamed a mountain…our mountain…the tallest peak on the North America continent. Unlike most tourists, the President heads home now with his enormous fleet of transport vehicles – ironically after plenty of finger pointing on this Global Warming tour. Astoundingly, with just this one trip, a bigger carbon footprint was created than what 33 cars combined would create in an entire year. From his many entertaining Instagram pictures, it looks like he enjoyed his trip, thankfully! Hard not to in the ever-changing ebb and flow of God’s Northern grandeur that has evolved with natural cyclic phenomenons, like tides rising and falling, glaciers advancing and receding, trees growing and dying in this energy-rich land that’s been reshaping itself since the beginning of time. The Hubbard Glacier…which is actually growing. The thousands of men and women working in extreme conditions to produce safe, available, American oil in our energy industry where jobs suffer such negative impacts due to the Administration’s anti-development mindset. Five Chinese warships off our Alaska coast – right there in the Bering Sea this morning – a signal that growing Superpowers like China (and Russia, with its recent brazen claims to lands and waterways that a sleepy America should be claiming) are no longer respectful of America, nor intimidated. The vast untapped natural resources trapped in the desolate ANWR region, locked up by Feds who ignore the will of the people of Alaska who support drilling. Blocked, despite there being enough crude to produce more barrels per day than we import from Saudi Arabia, thus easing our dependence on unstable, unfriendly foreign sources of energy. Development creates jobs…it’s the only real “stimulus package” the Feds should have engaged in. Drill, baby…eh, you know the rest. Palin to Trump: More power to you. Here’s to “Making America Great Again”! What a hoot to watch pundits clutching their pearls and whimpering for smelling salts aghast over the latest “shocking” thing Donald Trump said, while The Donald ignores them and continues to soar. Silly kingmakers just don’t know what to make of this. Well, we do! The elites are shocked by Trump’s dominance, but everyday Americans aren’t. Everywhere I’ve gone this summer, including motorsport events in Detroit full of fed up Joe Six-Pack Americans, the folks I meet commiserate about wussified slates of politicians, but then unsolicited, they whisper their appreciation for Trump because he has the guts to say it like it is. Trump’s unconventional candidacy is a shot in the arm for ordinary Americans fed up with the predictable poll tested blather of squishy milquetoast career politicians who campaign one way and govern another. But it’s not just how Trump says it, it’s what he’s saying. Trump has tapped into America’s great populist tradition by speaking to concerns of working class voters. He talks about fighting to bring back our factories. When was the last time a candidate talked passionately about reclaiming our manufacturing base (and knew what he was talking about)? What other candidate chooses American workers over the multinational corporations donating to their campaigns? Who other than Trump is talking about the dangerous trade deficits deindustrializing America and stealing our jobs? The old Arsenal of Democracy that allowed us to win World War II is now such a distant memory that we can’t even build the parts for our own military equipment – we need China to manufacture them for us. How can a great nation maintain its greatness without a manufacturing base? Or without secure borders for that matter? Trump focused in on two major populist grievances: the loss of working class jobs due to awful trade agreements, and the unfair competition for those jobs – along with security threats – due to the flood of illegal immigrants pouring across unsecured borders. To these, Trump offers bold, brash solutions based in common sense and real world experience. Now throw in Trump’s candor about “winning” and you understand why his message catches fire. As General Patton said, “Americans play to win all the time.” But those of us outside the Beltway can see that America isn’t winning. Our enemies laugh at us. Our friends can’t rely on us. China is outpacing our military superiority. Putin thumbs his nose at us. ISIS seizes territory our sons and daughters fought and died to liberate. Iran gloats over the idiotic and ultimately catastrophic nuclear deal the White House caved on. Our friends in Israel shake their heads at our betrayal. Trump diagnoses our problems as incompetent leadership. Who can argue with that? How many politicians promised to secure our borders? So, why aren’t they secured? How many politicians promised to grow American jobs? So, why did they vote for Obamatrade? Is it any wonder that Americans are telling status quo politicians, “You’re fired”? For everyday Americans the beauty of Trump’s candidacy is that he’s not a politician. There’s hope the guy who wrote “The Art of the Deal” can finally close the deal on all the broken promises of career politicians. Maybe the man who actually builds things, big things, can rebuild America’s entrepreneurial spirit with government put back in its proper place. The average American doesn’t ask for much. We want security and the freedom to prosper. Many politicians are now offering solutions for security, but what about our prosperity? Trump boasts about his wealth, and average Americans cheer him on. This is the secret the chattering classes will never get. Americans don’t begrudge wealth honestly earned. We celebrate it! Trump made his money the old fashioned way with brick and mortar. He built big buildings and proudly stamped his name on them. He actually created jobs – lots of them. Like so many great American entrepreneurs, Trump has the flair of a showman but the sensibilities of an ordinary guy. He may be a billionaire, but refreshingly, there’s nothing elitist about him. He’s saying to the average Joe, “I worked hard and I succeeded and I want you to also.” That’s the fabric of our national character woven by work ethic and dreams and drive. That’s America! It’s no surprise pundits and politicos are determined to destroy a candidacy they can’t control or shape with their mere words. Expect marginalization of anyone speaking well of Trump’s efforts. He’s a threat to the permanent political class. Non-traditional candidates always are because when they’re in touch with the people, they show their guts and just do the right thing. They go rogue – and take flak from all sides. Some of us have the scars to prove that. Thankfully, Americans are on to the media’s games. The politics of personal destruction has lost its shock value. We have serious problems in this country. Ferreting through old divorce records and playing gotcha with past misstatements are just stupid distractions. Shouts of “But he donated to Democrats!” won’t sway Trump enthusiasts. The man built a skyscraper in New York City – of course, he had donated to Democrats. If he was building it in Salt Lake City, I’m sure he would have donated to Republicans. “But he changed his mind on positions!” Reagan had been an FDR Democrat. Should we hold that against him or be grateful he saw the light? The GOP establishment would do well to listen to these voters and quit dismissing them. Reagan understood these blue-collar salt of the earth Americans. That’s why they gave him two landslide victories. If you want to win again, GOP, you need these good people. Anticipate more battering and bashing storms around Trump. It’s still very early in the game; folks are keeping their powder dry with candidate support but are quite happy Donald Trump is in the race. More power to you, Donald. Here’s to “Making America Great Again”! Gov. Palin: Happy Fourth of July! Happy Fourth of July! This day epitomizes what is unique and beautiful about the greatest nation on earth, our own America. Countries are normally based on geography or ethnicity, but ours is based on ideas that bind us together and were declared in writing on this day in 1776. On that day we were united. It is time for that unity again, so that we may stand again. To explain to the next generation what those essential, exceptional ideas are, ask a child to look closely at a handful of loose change and read what’s written on our coins: E Pluribus Unum. In God We Trust. Liberty. These are the notions our nation was built on, and they are still true and necessary today. Divided from these precepts our nation will fall. This Fourth of July, we celebrate our Founders making their desire for liberty plain by declaring their independence from Britain’s King and his burdensome government. May that same unifying desire and courage to fight for God-given sweet freedom be our driving force today. God bless you all and God bless our United States of America! Just a quick pre-Independence Day post, remembering last 4th of July family reunion in Coeur d’Alene; so thankful for a big beautiful extended family all in love with America! A continued sincere “thank you” to all the nieces, nephews, aunt & uncles, sons & daughters serving in uniform. And to our respected veterans – you are the civilian side of the family’s heroes! And have to add one more… just to keep some people thinking. Have a wonderful & safe 4th of July eve! And the “Flag Attack” rages on! In Arkansas there is a flag battle, but not the one you’ve been reading about. The Bradley County Courthouse has flown an historic flag just below our stars and stripes; it features a simple evergreen tree and the phrase “Appeal to Heaven.” The ATH flag has a rich history, being first commissioned by George Washington to fly over Navy schooners during the Revolutionary War. Washington knew the colonies needed God’s intervention as they battled for freedom – they had no recourse but to call on God. The appeal to heaven ultimately granted America freedom. This is our foundation! And the few who disdain this foundation want the innocent but illustrious flag removed. Special friends, Pastor Dutch and Ceci Sheets, presented me with an Appeal to Heaven flag of my own. It has stirred my heart and will stir millions more once the significance of this flag attack is understood. The angry opposition to the evergreen-emblazoned bolt of cloth spews from those refusing to acknowledge the truth – that the patriots of old knew America’s hope for freedom was rooted in God. And unlike any other, the idea of “America” would be exceptional in that we would dedicate to God this land overflowing with the blessings of liberty. In Bradley County, the ATH flag has flown over the courthouse, until the Freedom From Religion Foundation – a group that spends its funds suing municipalities who don’t see as they do – demanded Judge Keith Neely take down the flag or be sued. The judge found himself in a tough spot, and without the budget to fight out-of-town lawyers, he was advised by the county attorney to remove the historic flag. Well, The Freedom From Religion Foundation rattled the wrong cage. This is an attack on freedom, on honoring accurate history, and is more of the fundamental transformation of America that will render us not only unexceptional, but unrecognizable. But not if we intercede. The solution? Get behind Judge Neely and the good folks in Bradley County who want to Appeal to Heaven for our nation. Religious freedom is what this republic was founded on – why kowtow to the few who threaten that right? I won’t deny our need for God’s grace and miracles to fundamentally restore America. Please join. Write your own “Appeal to Heaven” in the comments below. Press in! And stand strong with those already standing for freedom. This attack on the ATH flag might seem irrelevant in light of all the important things happening right now, but it’s symbolic and symptomatic of the precarious position we’re in when it comes to religious liberty, our entire Bill of Rights, and our need to openly acknowledge the ultimate source of our country’s blessings. May we never doubt that a Providential Hand will always guide us to a better future as long as we are humble enough to seek that help. Intriguing use of “her or his”, referring to protector of the Constitution. Is it too much to ask “Constitutional Scholars” to be faithful to the Constitution? The most intrusive big government takeover in history – the Obamacare debacle – is now step-by-step tragically enabled by a handful sitting on the Supreme Court. They, who don’t understand our Constitution, are deceiving those not paying attention by acting as if the federal government is more powerful than our individual states, and worse, is greater than individual free and capable Americans. THIS is why a sincere protector of the Constitution must win in 2016. Her or his appointments to the bench WILL make or break America. The purpose of the United States Constitution is to impose restrictions on government, to not feed the beast until its expansion suffocates a free people. As noted below, the Obamacare ruling just spoon-fed our obese Oval Office that is filled with those ignoring the will of the people along with our founding documents. The solution? Demand answers from candidates. Ask them: Is it too much to expect judicial appointments and the politicians doing the appointing who swear to God they’ll uphold the Constitution to be loyal to the oath? Free at last from FOX News, will Gov. Palin run in 2016? With her separation from FOX News, Governor Palin has gained the freedom to appear at will on other television networks and to ….run as a candidate in 2016, if she chooses! Fox News has ended its relationship with former Alaska Governor Sarah Palin as a political contributor. A Fox News Channel representative on Wednesday confirmed a report on Politico.com that said the cable network had not renewed its contract with the 2008 U.S. Republican vice presidential candidate. The relationship ended June 1, Politico said. Palin, whose conservative stands have made her a favorite of the Tea Party movement, is expected to make occasional guest appearances on Fox News Channel or its sister outlet, Fox Business Network, Politico reported. Palin, 51, had been a regular contributor and political commentator on Fox News for the past five years, often appearing through a camera installed in her Alaska home. She currently is the host of “Amazing America,” a show on the Sportsman Channel focusing on veterans and outdoors life, and heads SarahPAC, her political action committee, which donates to conservative candidates. Palin was governor of Alaska in 2008 when John McCain chose her to be his running mate and the first woman on a Republican presidential ticket.